First off, I'm a guitarist. I've been playing 10 years - live, recording, teaching and teching. I got this on whim. Its the kind of gadget you see that has a nice premise but you dont expect it to pan out - such things normally have some un-anticipated horrible flaw/s that relegate them to a drawer, back of the tool cupboard, shoebox or even the bin. But now and then I like to give new toys that have a different slant on old things (or are totally new things) a shot. This has performed far beyond my expectations. It seems silly to wax lyrical about a device that you've had for all of weekend and doesnt do anything really new, but it works so well, you cant help it. - Its accurate. 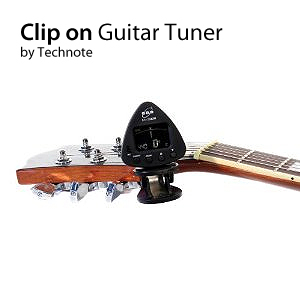 This is a must for a tuner, so lets get it out of the way. I trust this tuner. - The vibration detection works fantastically. I've clipped it to the most and least resonant of my many electrics and my sole acoustic and it picked up them up just fine. - It can tune fretted notes fine as well, so you can intonate with it. - You dont need a cable for it. It doesnt even have a jack for one. All in all its great for just sticking on your headstock and forgetting its there until you think youre out of tune or need to know that youre in tune. Its especially good for recording, and has taken up residence in my home studio, because you need to be in tune for every take, and this is the easiest way to check - no plugging in and unplugging every 2 minutes. Strongly recommended for ALL guitarists of all skill levels and walks of life. It'll make your other tuners obsolete.